Two images one of a man, the other of a woman. Question: On looking at them how long did it take you to determine the gender of each photographee? Did you even have to think about it? - would a small child would get it right? I found the image of the woman via this post on Homepaddock on "gender stereotyping". It was used to illustrate the post Ele had linked to from hers. 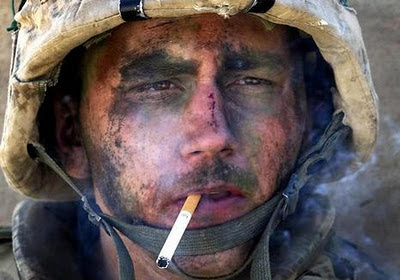 The woman's picture is a curious photograph to say the least, the use of the cigarette which recalls the Malboro Man, as well several well known photographs of infantry men after battle (including the one shown here). A masculine femine woman? Hmmmm. There is something really very odd about the picture of the woman which screams at me. And in noticing it are you gender stereotyping? 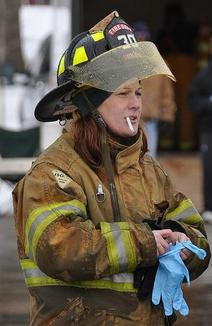 A smoking fire fighter is oxymoronic regardless of whether it's a fire man or woman. Is she about to put on rubber gloves? Long hair. Therefore, must be female. Look at her face Oswald, look at her hands. What do your face and hands look like after you have been doing stuff? I used to glove up before doing it. If you have time for a smoke first, whatever is unpleasant is not living. Or the photo is staged. I'm fairly certain it is staged Oswald - not only because of her face and tiny hands which have the appearance of being freshly scrubbed with pears soap notwithstanding the state of her apparel which implies recent action but her hair. The side on ponytail provocatively dangling from her helmet is more appropriate for a modeling a swimsuit on a catwalk than heavy action. I have daughters with long hair and whenever they are doing stuff it gets tied tightly up, constrained and kept out of the way for fairly obvious reasons. Indeed, Andrei. Only a very crazy fire-person would wear their hair outside of their fire-proof jacket!